Allows to store the username and password on this computer,so there will be no need for you to enter your username and password on your further logins. ("Cookies" support should be enabled on your computer). Click this link to restore your password in case you forgot it. Your password will be sent to your email address. Homepage is the start-up page containing your account statistics in the "System Summary" column and a toolbar enabling quick access to any part of the system in the "Toolbox Panel" column. The Work Area consists of a header menu, main menu, work area, and a key bar . The Main menu enables quick navigation through the system. The Work Area includes the following components - caption line, tables and forms. provides information on your exact location in the system. It contains the name of your current page and its full path, which you can use for direct navigation through the system. The Form Maker Pro system abounds has numerous, specially designed for manipulating data in a precise and quick way. Group actions - allows the operation with multiple data. Group operating is applied to the checked data strings. Sorted column - the column the data is sorted by. Usually its captionis is colored. Sort Order - the icon which displays sorting direction.If the column header has an icon SortOrder this means that this column is not sorted yet. Unsorted column - the column which can't be sorted. In order to simplify your work, all the icons mentioned above are provided with pop-up help. Table Navigation - table navigation, occurs when the data takes more than one page. link icons which make it possible to go a few pages forward and back. It's also possible to go to the specific page by clicking its number. For multiple pages (for example, in log templates) you can use quick search. Action buttons -buttons to add elements to the table. - the Button button (should be pressed before saving information). The majority of forms have fields marked with a star . 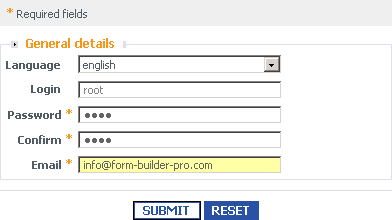 These fields are required to be filled in, otherwise an error occurs and the form will not be submitted.